Home Uncategorized Behind the Bartender: Christiaan Rollich of A.O.C. 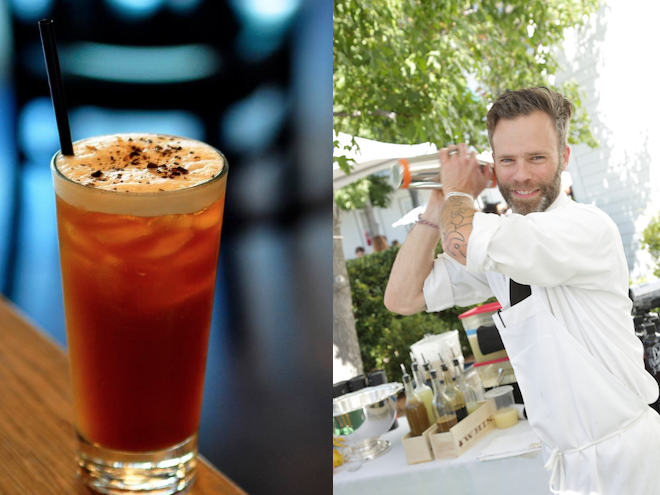 Behind the Bartender: Christiaan Rollich of A.O.C. It’s hard to believe that a bar talent like Christiaan Rollich was so close to going into the medical field. Just when he got his degree for respiratory therapy, a stable and noble profession, he was offered the opportunity to take command of the bar programs for Caroline Styne and Suzanne Goin’s Lucques, A.O.C. and Tavern. It’s been five years since Rollich chose bartending over bedside manners but he continues to create head-turning, palate-pleasing craft cocktails to pair with the James Beard award-winning cuisine. Even his mocktails are garnering accolades. What’s the most popular drink at your bar? Kingbird at A.O.C: Hand-picked barrel Elijah Craig 12 yr bourbon with Cassia bark, roasted chicory, sassafras leaves and maple. My family, daily life, childhood flavors, licorice, molasses, malt, farmers markets. Sunday suppers at Lucques, every week my chef Suzanne Goin comes up with a new three-course menu and every week I match it with a new cocktail. Great meal, great cocktails. The next big thing in cocktails is ______? Bols Genever. I know for the cocktailians it has been around for a long time, but I think for the guests it is a taste they are about to wrap their head around. First scotch got more popular, followed by bourbon, right now gin is making nice strides. The logical next thing would be genever. I am a licensed Respiratory Therapist. The guy they call when everything else is failing. I keep you breathing even if you do not want to. Gloria’s Cafe on Venice Boulevard. Monday nights we go there with the whole family. My son knows the table he likes to sit on, my wife knows the food she like to order and I drink beer and eat while watching the important things in life happen in front of me.